Wharton School lecturer and long-term care expert John Whitman addresses the opening session of the National Summit on the Future of America's Nursing Home Industry. Funded by the RWJF President's Grant Fund at the Princeton Area Community Foundation, the event was co-sponsored by Penn's Leonard Davis Institute of Health Economics (LDI) and the TRECS Institute. Its goal was to produce a working paper of suggested regulatory reforms for the Centers for Medicare and Medicaid Services (CMS). The U.S. nursing home business faces daunting economic and policy challenges as it moves toward a massive wave of baby boomers aging into infirmity, according to a gathering of industry executives at the University of Pennsylvania’s Leonard Davis Institute of Health Economics (LDI). Convened to gather raw material for a formal report on suggested reforms for the Centers for Medicare and Medicaid Services (CMS), the National Summit on the Future of America's Nursing Home Industry focused on the changing demographics, reimbursement models, clinical practices, and government rules of elder care facilities. 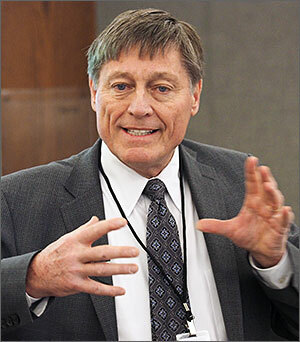 John Whitman, MBA, NHA, has been a Wharton School lecturer for 29 years and heads the TRECS Institute. Keynote speaker and Summit organizer, John Whitman's opening "State of the Industry" address painted a picture of widespread economic tumult across today's nursing home industry and the likelihood of larger problems over the next several decades. "The changes this industry is being hit with every day are massive and significant in terms of economic realities," he said. Whitman, MBA, NHA, is an alumnus of the Wharton School where he has lectured on aging and long-term care management for 29 years. He is also Executive Director of the TRECS Institute, a long-term care consulting firm. TRECS and LDI co-sponsored the National Summit, which was funded by the RWJF President's Grant Fund at the Princeton Area Community Foundation. Whitman drew nods of affirmation from participants as he characterized the nursing home industry's matrix of traditional assumptions, regulatory rules, clinical practices, and misaligned incentives as one plagued by out-of-date policies that are a barrier to both fiscal viability and quality care. "One of the goals of this program," said Whitman, "is to raise the level of awareness about the situation. So much of the change happening across the long-term care community could drive negative outcomes if we don't pay attention to it and begin to take steps. This has not been elevated to the priority level that it really needs." The audience of five dozen included nursing home executives, physicians, nurse practitioners, pharmacists, various university researchers, and representatives from organizations such as the the Center for Medicare and Medicaid Innovation (CMMI), the American Health Care Association, Leading Age, the National Association of Directors of Nursing Administration in Long Term Care (NADONA), Philadelphia Corporation on Aging and the Center for Advocacy for the Rights & Interests of the Elderly (CARIE). One of group's major concerns was the shifting demographics of the business. "We still tend to use the word 'senior' but that has become a totally inappropriate description," Whitman said. "Seniors span four and five decades now. They come from diverse backgrounds in terms of economic capabilities, family supports and ethnic origins. We have individual nursing homes where as many as five languages are spoken. That increases costs and creates a quality-of-care issue in terms of understanding what a patient needs." Whitman emphasized that many of the problems identified by Summit participants were the result of the industry and regulators' "status quo mentality." As an example, he pointed to the new telemedicine technologies that are just beginning to be used in nursing homes. "We also know," he continued, "a good percentage of those patients never should have gone to the hospital but they did because, at 2 a.m. on a Sunday morning, the nursing home lacked the ability to tell if Mrs. Smith's medical needs required hospital admission or not. But in recent years, new telemedicine systems have created the potential to do just that." In 2015 Whitman and David Chess, MD, an Assistant Clinical Professor at the Yale University School of Medicine and CMO of the telemedicine firm TripleCare, did a telemedicine study at the Cobble Hill Health Center, a 360-bed skilled nursing facility in New York. Over a year's time, 91 hospital transfers were avoided after the patients were evaluated in-house by a two-physician telemedicine review. "So when we start looking at preventing avoidable hospital admissions, telemedicine can be a huge piece but not the only piece," Whitman said. "There are a variety of things every facility needs to be doing that aren't getting done today." Older and sicker demographics is another industry concern. "When I was (a nursing home) administrator," said Whitman, "the average patient came in and stayed for three or four years. But today's nursing home population is coming much later. They're older, much sicker and require a lot more care. Their length of stay has dropped dramatically. Facilities are telling us the average stay is 90 to 100 days rather than several years. That means more resident turnover and more marketing costs." Meanwhile, nursing homes face unprecedented levels of competition. "It's coming from every direction," said Whitman. "Life Care retirement communities, PACE Programs, assisted living adult day care centers, increased use of home care and a significant push by both state and federal agencies to keep seniors at home through 'home and community based programs.' Changing reimbursement models, like CMS’s Bundled Payment Program are encouraging the wider use of home care." He pointed out that, particularly in orthopedics, hospital patients that used to go to nursing facilities for rehab are now bypassing those facilities completely. Hospitals are keeping them for an extra day or two and then discharging them to home-based health care therapy. The preferred provider networks that have risen during the Affordable Care Act era are also heavily impacting nursing home economics, he said. Such networks partner with only a few nursing homes in a given region. Whitman cited one area where a major provider network directed its patients to only 5 of the region's available 35 nursing homes – resulting in those nonpreferred facilities receiving significantly fewer Medicare and private pay patients. "Once a nursing home is in the nonpreferred status," Whitman said, "their census of Medicaid patients rises and that can begin a downward spiral. Medicaid in 35 of 50 states pays an average of $23 below the actual cost of providing care. So, unable to attract Medicare or private pay residents these facilities then start admitting even more Medicaid residents to help fill their beds -- as financial losses continue to increase." "You don't have to be a Wharton grad to realize the economic implications of that," Whitman said. "But that's the risk this industry is facing right now." Along with their struggle to attract sufficient numbers of better paying patients, nursing homes face a similar struggle recruiting and retaining staff. According the Summit participants, this is an "enormous" issue with employee turnover rates in many facilities running as high as 60 or 70%. Whitman pointed out that even at the nurse's aide level, each time an employee leaves, it costs a facility between $2,000 and $10,000 to replace them. Whitman cited difficulty in filling even nursing homes' most important position -- director of nursing (DON). "It's critical," he said. "You can have a Medicare 5-Star facility and the Director of Nursing leaves. The owners bring in another DON who isn't as strong and things deteriorate quickly. I'm concerned we don't have enough people coming into these DON and administrator positions. I don't see a lot of interest among young people -- as an industry we need to do a better job at recruiting, educating and training young people for these critical positions." Another area of concern he pointed to is the Centers for Medicare and Medicaid Services (CMS) Five-Star Quality Rating System. Whitman noted that both consumers and providers now frequently use that system when making decisions. Launched in 2008, the national rating system was designed to make it easier for consumers to compare nursing homes. It uses information collected from health care surveys, quality measures and staffing patterns to rate a nursing home from 1 to 5 stars, much like a restaurant review system. Whitman said the industry is being hurt by the manner in which the star rating system is currently applied because, despite its wide acceptance, it is not a true reflection of an individual facility's quality. "In the greater Philadelphia market, for example" said Whitman, "you have 178 nursing homes; 25% are in the five-star category, 23% are four, 20% are three and over 30% are in the one or two-star category. These last two are at the greatest risk of not being selected for preferred provider networks." "Historically," Whitman continued, "after two or three years of struggling in this downward spiral, a facility would be put on fast track for closure by the state because of their inability to meet regulatory requirements and decreasing quality of care for its residents. But if you have 30% of the facilities close, you don't have enough capacity to absorb all those patients. And what are we going to do when the baby boomers hit and we need more and more beds? There's a big opportunity to make some needed changes here." The Summit proceedings will be the basis of a list of recommendations that will be delivered to CMS in the near future.